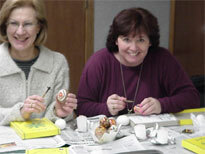 Saint Luke hosted 30 members of the Bethany Lutheran Church from Lemont, IL. The visitors came to acquire a better understanding of the Eastern Orthodox faith and to learn how icons are used in Orthodox worship. 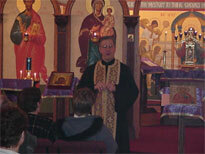 Father Andrew presented a brief history of the Orthodox Church. 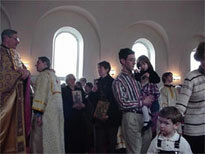 During the question/answer period that followed, one visitor asked when the Orthodox Church split from the Roman Catholic Church. 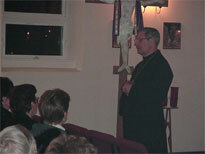 Father Andrew explained that history can become distorted and that it was the Roman Catholic Church that left the Orthodox Church. 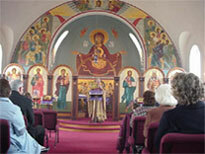 Alexandria Lukashonak, chairperson of the Adult Education & Icon Ministries, described the use of icons in Orthodox worship. In her informative presentation, she explained in detail the icon of the Virgin Mary located in the apse above the sanctuary. This icon, called the Virgin of the Sign, is evangelistic because it presents the Virgin Mary as the ideal Christian who witnesses to Christ. For a taste of Orthodox worship, members of our choir sang various hymns from Great Vespers and reader John Verderber demonstrated chanting. 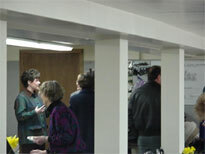 After the presentation, everyone gathered in the basement for cofee and home baked sweets. It was absolutely delightful for everyone to share in an evening of fellowship. 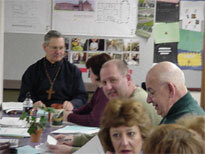 We "Saint Lukians" look forward to gathering again with our Lutheran brethren in the unity of Christ! 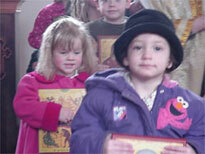 Please Note: Several of the better pictures of this event were lost due to a defective disk in the camera. 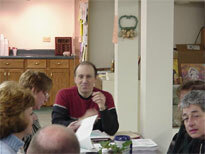 On Saturday March 10th, Ken Stevens held a strategic planning workshop for the parish councils and ministries. Ken has been working hard gathering surveys, contacting lapsed members, and in general gathering all the information he can. Based on this information, a stategic plan is being developed and implemented to address our weaknesses as a parish and the concerns of our parishioners. 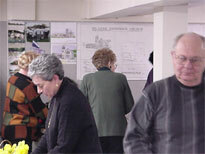 As time goes by you will receive information concerning these developments and new programs. Please be open to becoming involved when asked. 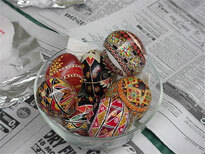 More than 1 dozen women from the parish gathered on March 10th, to learn to make traditional Ukrainian Easter Eggs (Pysanky). 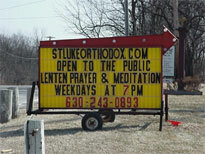 This year St. Lukes will be open Monday through Friday at 7:00 P.M. for prayer and meditation. Readers will be present and all are welcome. Many of us have had fun with Father's rent-a-sign but it's working. 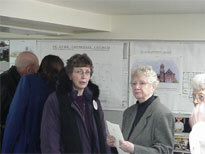 There have been a considerable number of parishioners and some visitors who have taken advantage of this time. By the way, the sign is only temporary and by next year we should have our own permanent sign inplace. 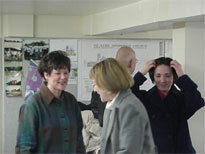 On March 7th, 2001, St. Lukes received zoning approval for the new multipurpose facility. 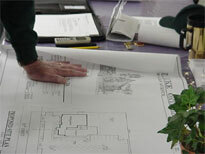 Now that the long wait is over; the architect is moving ahead on the building plans, construction bids are being finalyzed, and permits for the well and septic system are being obtained. 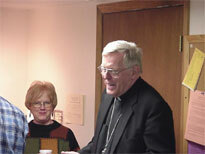 Bishop Job will be at St. Luke's April 4th, for a groundbreaking ceremony. 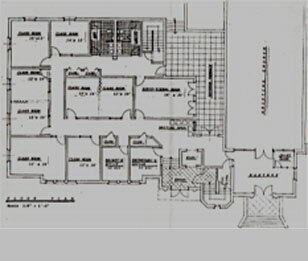 And with God's grace actual construction will begin in late May / early June. 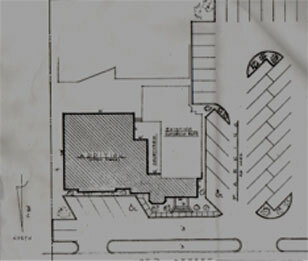 Below are the preliminary plans for the first floor and the site plan. 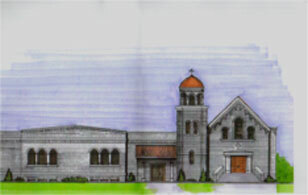 Above is an artists rendering of the front of the building. 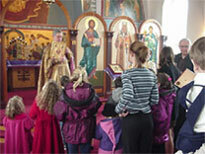 Father Andrew preached on the meaning of icons. He used as an example the Icon of the Hospitality of Abraham (sometimes called the Old Testament Trinity) by St. Andrew Rublov. 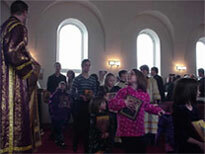 At the end of the service all children and adults were invited to participate in a procession of icons. 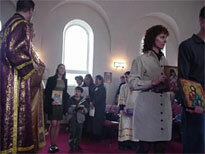 At the completion of the procession, everyone recited the Proclamation of Orthodoxy. As the Prophets beheld, as the Apostles have taught, as the Church has recieved, as the Teachers have dogmatized, as Christ has awarded let us declare, let us assert, let us preach, in like manner Christ our true God and honor His Saints in words, in writings, in thoughts, in deeds, in churches, in holy icons -- worshipping Him as God and Lord and honoring them as His true servants.